Every day we, at Fox Plumbing & Heating get to meet our neighbors and help them with all of their needs. Do you want to work with the best plumbing, heating & cooling company in town? 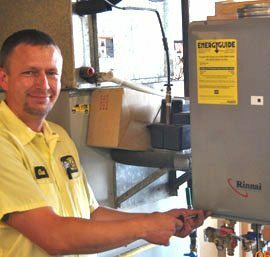 Our plumbing professionals and heating and cooling specialists promote a premium level of customer service and quality. Working for Fox means that you’ll have access to ongoing professional training, and a team that will support your professional and personal growth. We also offer a number of incentives and training tools to help make the most of your skills and training. Fox Plumbing & Heating is always looking for certified Journeyman Technicians. We currently work with Plumbing, Sewer, Side Sewer, Water Line, Traditional and Tankless Water Heaters, Toilets and Faucet installations and repairs. And we’re looking for experienced and new professionals on an ongoing basis. If you have a passion for learning ,understanding problems and helping people then we want you to be a part of the #1 Seattle Plumbing Company team, the Fox Plumbing, Heating & Cooling Team. Our Heating and Cooling division is growing constantly, and that’s a great thing for young professionals. As we grow and service friends and neighbors, you have the opportunity to be a part of the team of professionals that will shape this team in the years to come. And coupled with Fox’s brand, you can be sure that the people you’ll be meeting are eager to work with you. If you have a passion for Mini-Split and Ductless systems, A/C, Oil and Gas Furnaces, Boilers and Fireplace installations, then you’re the person we’re looking for at Fox Plumbing, Heating and Cooling. We offer numerous incentives to new and ongoing employees, and we are constantly looking for individuals who want to make a difference. We encourage you to hit the apply button below, and take the first steps to a rewarding and financially secure future. Our customer service representatives are the first point of contact for Fox Plumbing, Heating & Cooling. They can make or break a relationship with a potential customer. It’s important that they are knowledgeable, conscientious, sincere, caring, dependable, have a positive attitude, and able to quickly identify our customers’ needs. They need to realize that the person on the other end of the phone may be experiencing an emergency and want or need help, fast. And that’s what Fox Plumbing, Heating & Cooling is here to do, we’re here to help. If you have experience in customer service and can respond well under stress then you’ll fit right in at Fox Plumbing, Heating & Cooling. Fox Plumbing & Heating takes pride in offering employment as an equal opportunity, drug free and honest employer. We offer growth career opportunities and competitive salary and training. Click here to learn more about our Employee Incentive and Training programs.